The holy month of Ramzan, involves fasting for a month and eating only pre- and post-dawn. While during sahoor, Muslims eat foods that give them energy to survive all day, Iftar is the time when they splurge on treats and end up eating unhealthy food or more than what is required. So, here are list of the tips that one should follow during iftar to prevent overeating and stay healthy. • The body's immediate need during iftar, is to get a readily available source of energy in the form of glucose. Glucose is particularly essential and needed for the brain and nerve cells. Include foods high in carbohydrates to compensate for the reduced glucose levels during fasting. 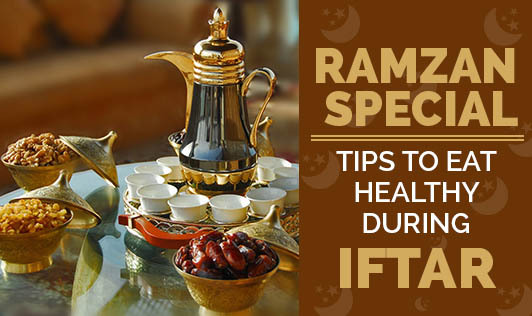 • Break your fast with simple sugar-rich foods like dates/figs or fruit juices. • Start your soups/porridge along with dates or tea. These are the best food items to have during iftar as they are light and prepare your stomach for dinner. • Do not have too many servings of sherbets and sweets as they contain a lot of sugar and are unhealthy. • Do not drink a lot of water immediately after iftar, as it will cause fatigue and stomach pain. • Eat a fruit or some nuts after iftar. You can also have ½ glass of fruit juice instead of fruits. • Avoid having desserts as they make you feel hungry after a while. • Avoid heavy meals for iftar, as it will put a load on your digestive system and may cause indigestion. • If you are planning to have dinner, make sure you keep it light, and have it 2 hours after your iftar. • Do not overfill your plate with food. Only take the quantity you need. • Do not go to bed immediately after iftar. Go for a short stroll or just spend some time with family members.